Hasselback Bacon Apple Butternut Squash tastes like it’s loaded with brown sugar and butter but it’s all natural sweetness. This dish is going to become your favorite way to eat squash. We used to stuff squash with butter, brown sugar and bacon, thinking that this was the tastiest way to eat it. This baby doesn’t have any brown sugar or butter, and we didn’t miss it. Now, there is bacon…lots of bacon, and I just can’t apologize. 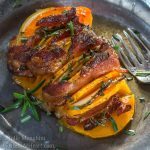 Hasselback Bacon Apple Butternut Squash is now my favorite way to eat it! I decided to cut it using the Hasselback method for a couple of reasons. Squash is a dense vegetable. By slicing it thinly it helped the whole dish cook at the same rate. It also helped to infuse more apple and bacon flavors into the squash. This is a meal by itself, or an amazing side dish if you’re sharing. One squash is a good four servings. The first half we cooked the same way but on a grill that uses lump charcoal. John said he kept the grill at about 375°F. The second half is the one you are seeing. I cooked it in the oven at 350°F. They were both amazing! Hasselback Bacon Apple Butternut Squash tastes like it's loaded with butter and brown sugar but it's all natural sweetness. Cut off each end of the squash. Place it in the microwave for 3-1/2 minutes. Remove and holding it with a towel, remove skin with a sharp vegetable peeler. Cut the squash in half and remove seeds. Slice the squash into 1/4-inch slices. Be careful not to go completely through. Alternating the bacon and apple, fill the slices. Place in a baking dish. Combine maple syrup and vegetable stock. Whisk to combine and pour over the squash. Top with a sprinkle of black pepper and fresh rosemary. Bake for 1 hour or until squash is softened, spooning juice over squash occasionally. Microwaving the squash makes it much easier to peel. Even though we didn’t add a bunch of butter and sugar to this recipe, you would never know it. It tasted sweet, tender and buttery all by itself. 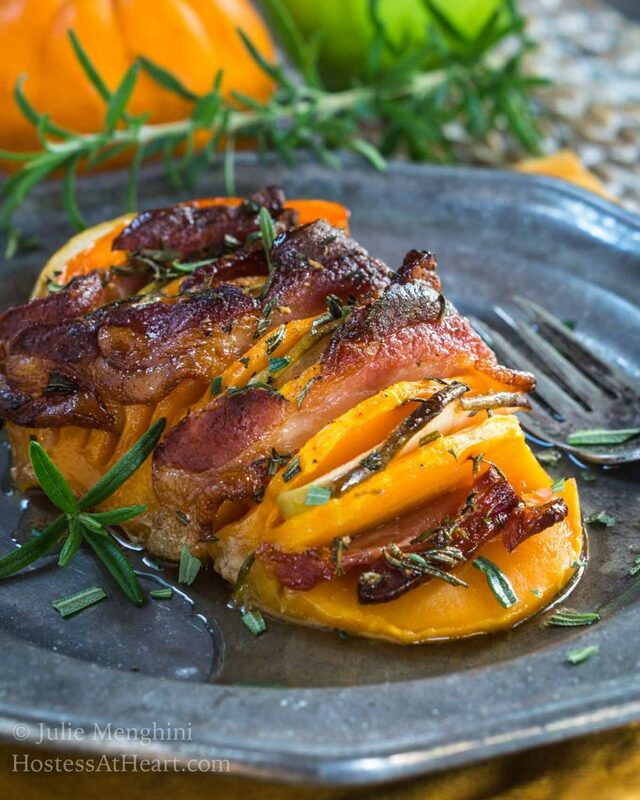 The herbs and bacon gave it a great savory contrast. We are eating so much more squash than we used to, and this is one of our favorite ways! I’d love it if you’d leave me a comment and let me know what your favorite way to eat squash is! 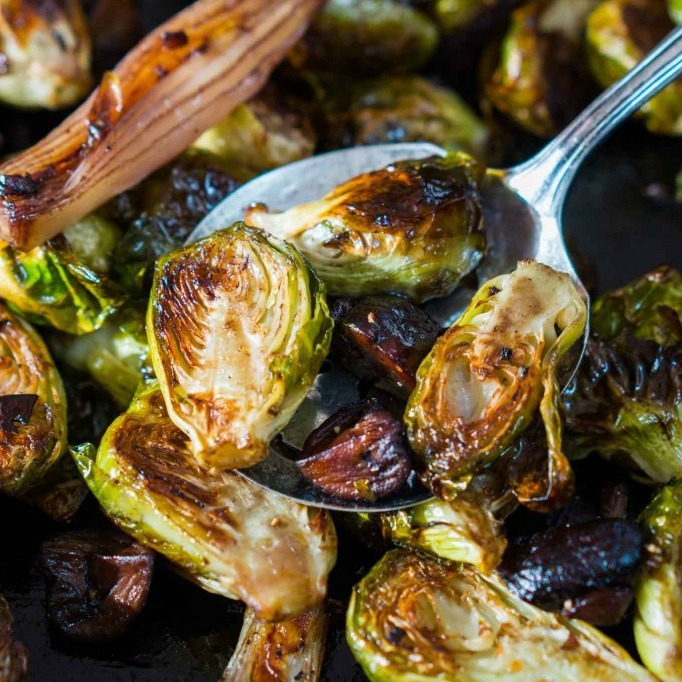 If you’re still looking for a few veggie dishes here are some of my favorites! Oh wow. I have to convince my boyfriend (he’s the cook, I’m the baker in our relationship xD) to make this for me. It looks and sounds amazing. Wow, drooling all over my computer right now… Happy Fiesta! Thank you Sarah! I love cooking with John too. He’s the grill guy and I’m definitely the baker. I hope you have a wonderful weekend! I LOVE this idea – why didn’t I think of this!? And bacon and apple, of course, go so well too. Thank you Caroline. It was sure easy and we really liked it. This looks beyond delicious, Julie! Practically a meal in and of itself. Thank you Eliza! We really enjoyed it and yes it is practically a meal. Squash is so good. Thank you Monika. We used to eat just acorn squash but I love butternut too. If you try this one I hope you will let me know what you think. Thank you Petra! We love bacon and it did really work here. Wow, Julie! This looks absolutely delicious! Congratulations on being featured and Happy Fiesta Friday! Thank you Antonia! I am humbled when I get featured. There are always so many amazing recipes to choose from. You had me at butternut squash but then you went and added apple and bacon? I’m in love! 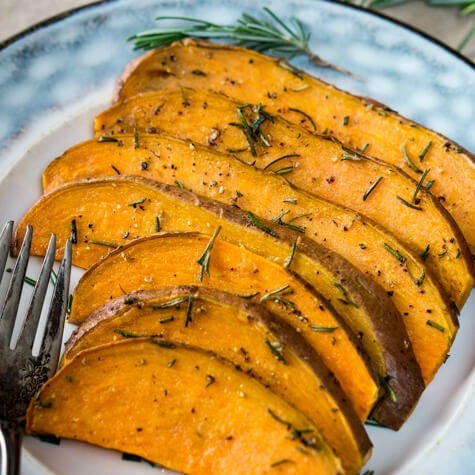 I’ve never made hasselback potatoes but I’ve been wanting to for a while but now I think I’d prefer to make hasselback butternut squash. Thanks again for sharing! Don’t forget to be eligible for features to link to Judi’s blog and mine, and to tag your post with Fiesta Friday. Thank you Maggie! We really enjoyed this recipe! I appreciate you stopping by and hope you have a wonderful week. Thank you so much Summer! We enjoyed it too. Ohhh that bacon juice all over the squash! I still have 40min til lunch and your photos are killing me! Thank you Ai! Looking through food photos are killers isn’t it! 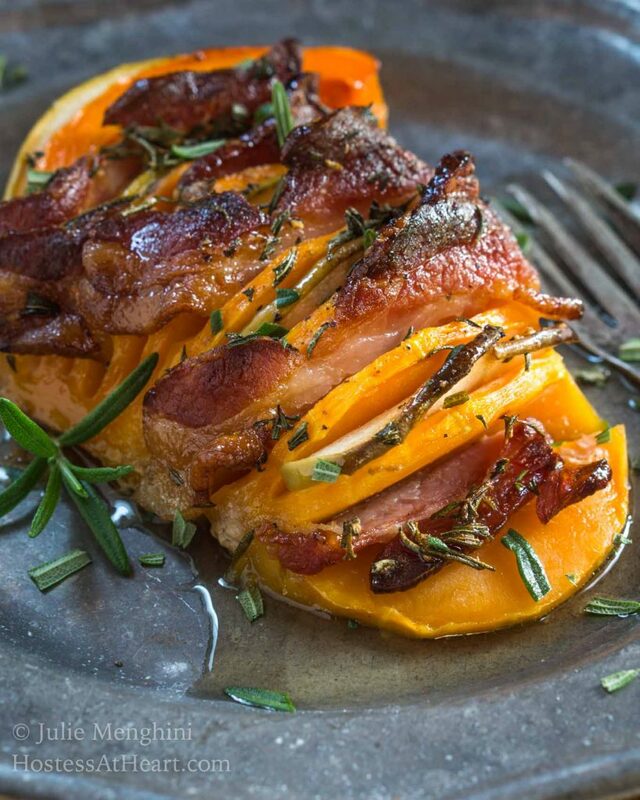 What a brilliant idea to use butternut squash in a hasselback way. I have never really cooked a potato the hasselback way, but you’re giving me some “food for thought” here Julie 🙂 Those pictures look so good and hard to resist. The bacon tops it all around nicely. Thank you, Loretta! I’ve really never made a hasselback potato. I’ll slice them up and fan them out in potato packets. Hmmmm another squash idea! Bacon is always good I think! Thank you Linda! We loved this squash. Julie, I have been sharing this recipe everywhere and now I have come on over to make this recipe. The boys have decided that bacon is one of the major food groups so I am thinking another great way to get them to sneakily eat their veggies. Shhh that will be our little secret. Thank you! I had to be a little sneaky to get John to decide he liked squash too! Bacon should definitely be a food group! I know I commented on this post and for the first time ever with one of your posts “awaiting moderation”. I wonder where it went or if this comment will go through. I am having trouble with some comments!!! I don’t know why you’re were awaiting moderation, Judi? How dare WordPress to that to an old friend! Truth be told I hardly ever know why the things that happen when it comes to the tech stuff. Thank you, Julianna! We are really enjoying this recipe. I hope you enjoy your week! 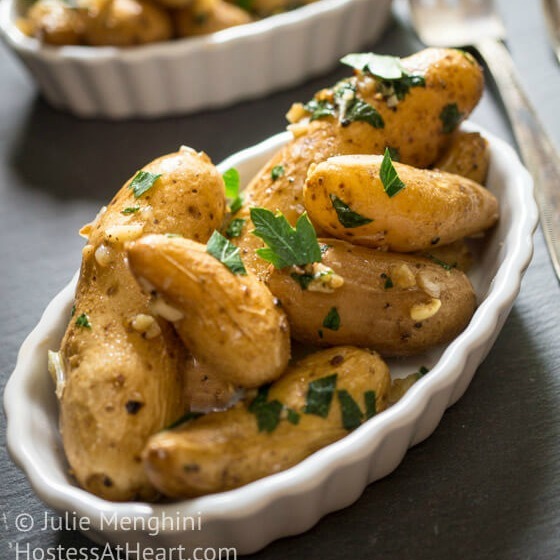 Great idea to use butternut squash to make these “potatoes”. The squash is big enough so you can add lots of goodies like the bacon and maple syrup – two very favorite ingredients. Happy Fiesta Friday Julie! I might add some cheese too! Cheese is always a great addition! Thank you so much Judi! Looking at the comments, your comments show up two different ways. As judigraber it goes through. As Judith A. Graber it’s held in moderation. I don’t know what’s the difference? Thank you so much for co-hosting this week! Oh my, this looks so delicious! 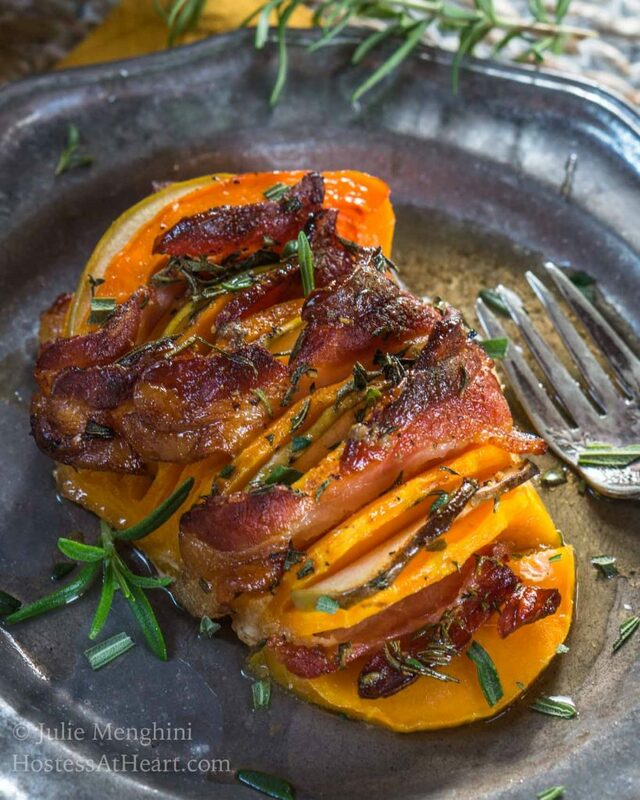 Adding bacon to the squash sounds like a great flavor combination! Your photos are mouth-watering! Thank you Jenny! You are so sweet to stop and leave super nice comment! Mmm, looking at the photos makes me hungry! I’m laughing because I thought, Oh that would be so good if only I left out the squash! lol! Seriously, I keep trying every year to warm up to squash and this recipe might actually do it…It does look delish!! Thank you Jess! They were really good. I hope you have a wonderful weekend Jess! I never thought to hasselback a squash, but what a wonderful idea! Love the natural sweetness and flavor combos. Pinning! Thank you so much Sarah. It worked really well too. That looks absolutely wonderful! I don’t think I’d even add that much maple syrup, but that’s just because I find squashes already sweet. Great idea! Thank you Mimi! I think you could cut the maple syrup and it would still be yummy.